This stroganoff was one of those dinners that naturally arises by examining a number of random leftovers: in our case, a container of lebni, a bag of mushrooms, some partial leeks and a bunch of fresh dill left from our post-Easter brunch. 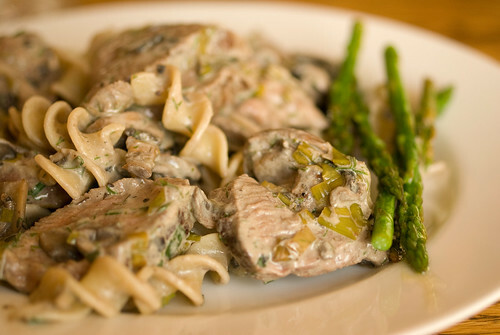 Combine all that with some sliced seared steak and some egg noodles and you have a really good quick beef stroganoff. I don’t think it would have occurred to me to use lebni in a stroganoff, but I liked the effect. It’s similar to sour cream but has a denser texture and is slightly less tart. It worked great with the mushrooms and dill. Come to think of it, that would be a really nice dip or spread right there – maybe I’ll try that next time I have these particular leftovers in the house.